Equipment health monitoring and analysis enables predictive maintenance, reduces downtime, and reveals design improvement opportunities. Remote sensing and data collection saves labor, time, and improves safety. Large machinery in a high vibration environment - Measuring machine structural and component fatigue is necessary to prevent breakdowns and improve design. Mining equipment manufacturers and operators have selected the SensorCloud™ platform to monitor the health of critical assets, improve operational efficiencies, and reduce downtime. Connect: In one application the SensorCloud™ platform was used to monitor fleets of vehicles instrumented with sensor networks. 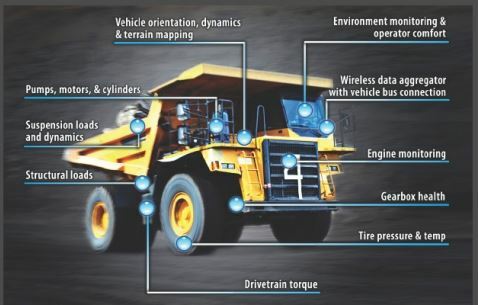 Each vehicle’s network consist of an on- board wireless data aggregator with cellular connectivity, along with 10- 20 wireless sensor nodes designed to monitor strain and structural fatigue. Monitor: Once received by the on- board data aggregator, sensor data is cached locally and automatically uploaded to the SensorCloud platform over the cellular link. Vehicle health data is immediately accessible to the customer’s globally distributed engineering team. Key health parameters are monitored with SensorCloud’s flexible alerting rules, issuing real-time alerts to the manufacturer and asset owners. 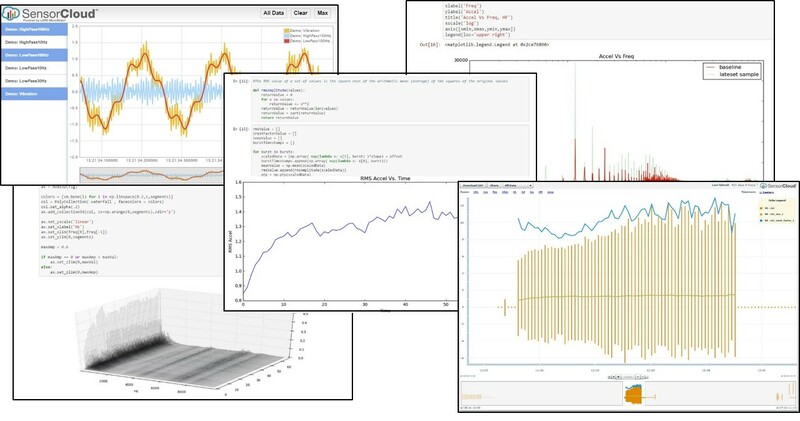 Analyze: Using SensorCloud's embedded MathEngine® data analytics tool, engineers are able to sift through large scale historical data sets, uncovering key insights for optimizing machine life across the fleet. The mining industry depends on reliable performance from high value machines that are exposed to incredible mechanical loads and stresses on a daily non-stop basis. Vibration readings, and analysis over time, are used to monitor machine health. Manual measurement techniques are time consuming and can put operators in dangerous situations. Mining operations are often in remote locations with limited internet connectivity for data sharing and analysis. Remote data analysis - Using SensorCloud with MathEngine analytics tool, engineers across the globe are able to review the vibration data.